The Frame Resize node allows you to scale the input frame. Drag the Frame Resize icon into the Node Graph. Connect the input frames to be resized. frame This input grows automatically when a value is connected. frame This output grows automatically when a value is connected. 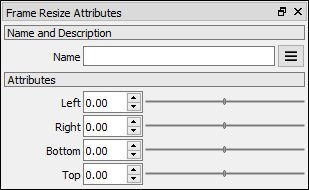 Left This attribute is exposed as input by default. Right-click the Node to hide this attribute as input and set the point values manually. Right This attribute is exposed as input by default. Right-click the Node to hide this attribute as input and set the point values manually. Bottom This attribute is exposed as input by default. Right-click the Node to hide this attribute as input and set the point values manually. Top This attribute is exposed as input by default. Right-click the Node to hide this attribute as input and set the point values manually.